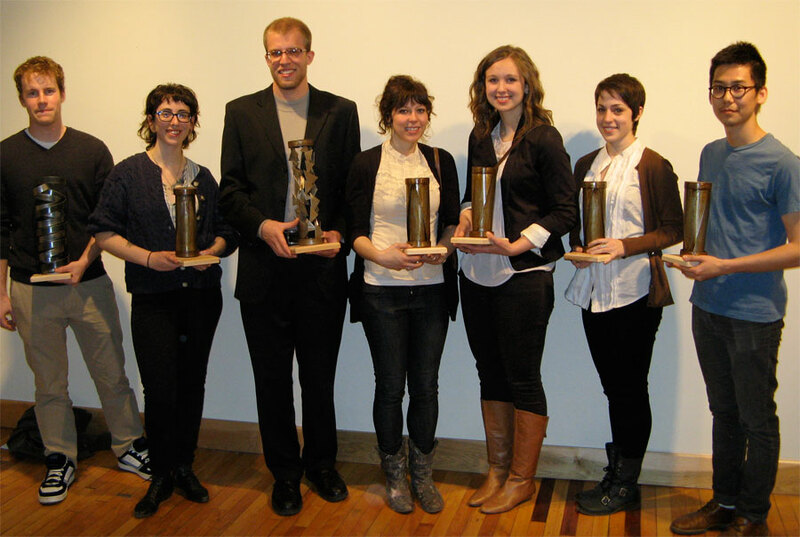 AICUO Award Winners (from left to right) Christopher Greathouse, Rose Hermalin, Ken Aschliman, Katherine Richards, Wendy Birchfield, Rachel Shelton, and Anh Hoang Vu hold up their unique physical awards. The AICUO Awards reception took place last night on the Ohio Wesleyan University (OWU) campus. Activities began at 5:00 p.m. with the Student Panel Discussion in the R.W. 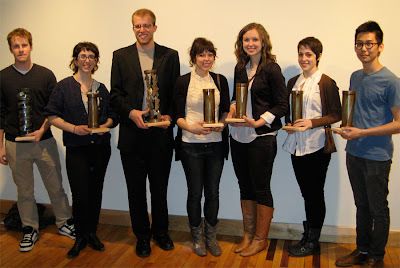 Corns Building, then proceeded to the finalists' exhibition in the OWU Ross Art Museum. The reception room boasted a showcase of the six finalists' works, ranging from 3-dimensional media to traditional oil painting, and a central table displaying the physical metal awards. After an interval of mingling and viewing the artwork, Todd Jones, president of AICUO, announced the various winners of the night, beginning with recognition for Caleb Boller, winner of the AICUO Sculpture Design Contest. 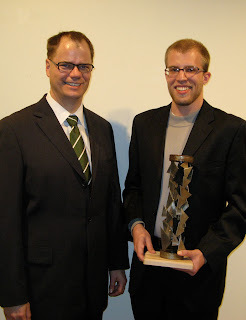 Next, Jones revealed the AICUO People's Choice Award winner to be Christopher Greathouse from Denison University. Each winner received a unique metal sculpture as a reward for their accomplishments, a legislative commendation from their hometown, and a prize package from our various in-kind sponsors. Following the People's Choice Award came the announcement of Ken Aschliman from the Columbus College of Art & Design as the Grand Award Winner. Along with the prizes listed above, Ken also receives a $2,500 cash prize as well as the chance to sell a piece of art to the AICUO office for permanent display.